With the snow firmly in its place for the foreseeable future, The Cottage is getting some much needed attention. Last week, I cleaned and organized my spice cabinet. I rescued the cabinet when I worked at MSU-Northern. It once housed a plastic mannequin that showed were human organs were located, and they were throwing it out, cabinet and all. I took the cabinet (left the mannequin!) and it was in storage for many years. I asked Jamey if he would make some shelves and put them in the cabinet, and he did so gladly and painted the inside white. It now holds spices, herbs, oils, and seasonings and looks great in my kitchen! I decided to keep the outside cabinet in its original finish rather than re-finishing it. I think it is more charming that way! 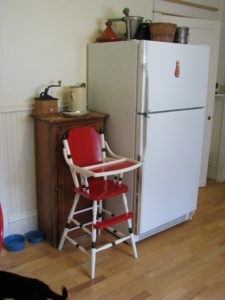 My spice cabinet is behind the Lucke high chair. It is such a convenient piece!